Concept: The presence of eastern white cedar (in any stand or site condition) defines this group. Only two broadly described Vegetation Types (VT) are currently recognized, one each in an upland and wetland setting. Diverse and well developed shrub, herb and bryophyte layers are typical. It is known that cedar can also occur on alluvial floodplain soils, shallow to bedrock soils and old field sites. Fact sheets for these units will be developed as more data are collected. 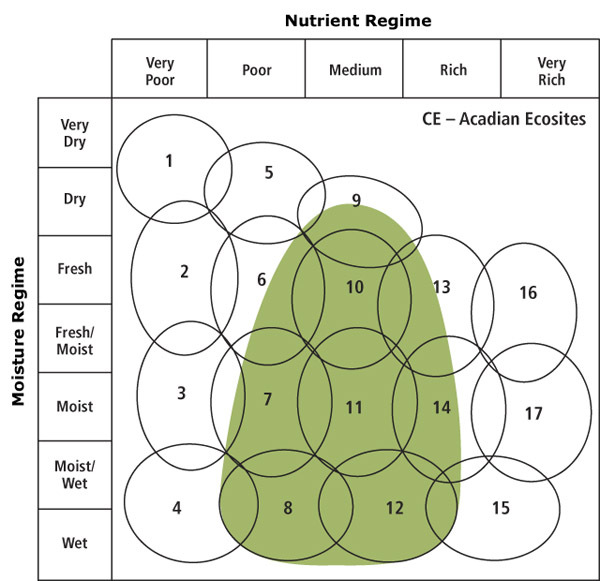 Vegetation types in this group are found only in the Acadian Ecosite group. Vegetation: Cedar, red maple, white ash, balsam fir and black spruce are common associates in the canopy. Understory vegetation reflects soil moisture and nutrient regimes present. The greatest diversity occurs on wet sites and in western Nova Scotia where Atlantic Coastal Plain flora are more common. Cedar regeneration is usually present in both VTs. Environmental Setting: Vegetation types in this group are usually found on lower flats, lower and toe positions of gentle slopes, shallow depressions and old river terraces. Most sites have little (if any) surface stoniness or exposed bedrock. Soils are generally derived from glacial till, fluvial and/or organic deposits. Site fertility is usually moderate to high. Vegetation types only form small patches on the landscape. This uncommon group is mainly found in the Western ecoregion (700) with a few scattered locations known in the Northumberland Lowlands (530) and Cumberland Marshes (550) ecodistricts. Old field cedar forests are known on the North Mountain ecodistrict (920). Cedar on alluvial soils are scattered along the Annapolis River and small tributaries. Cedar on shallow soils over bedrock are scattered along the Valley Slope ecodistrict (710). Successional Dynamics: Successional dynamics of cedar VTs in Nova Scotia are not fully understood. Cedar is a shade tolerant species and can regenerate and persist in the understory until openings allow further development. Between stand-level disturbance events, natural tree senescence should promote uneven age class development. Ecological Features: Occurrences of this small patch ecosystem rarely cover a hectare. The overstory is typically well developed, composed of cedar and other tree species. Cedar stands are clustered in two different areas of the province; a small group of stands are found in the northern mainland, while the remainder occurs in the western counties. These geographically isolated sub-populations show little evidence of genetic interaction and it is unclear whether they were once continuous or whether their separation has been long standing, resulting from different post glacial migration events. Cedar trees are relatively long lived and very resistant to disease, insects and decay. The foliage and bark of young trees are a favoured browse of several herbivores, including deer, snowshoe hare and porcupine. Wetter stands in western Nova Scotia often support Atlantic Coastal Plain Flora, including some rare species. Cedar is legally protected and listed as vulnerable under the Nova Scotia Endangered Species Act. Occurrences of this small patch ecosystem rarely cover a hectare. The overstory is typically well developed, composed of cedar and other tree species. Cedar stands are clustered in two different areas of the province; a small group of stands are found in the northern mainland, while the remainder occurs in the western counties. These geographically isolated sub-populations show little evidence of genetic interaction and it is unclear whether they were once continuous or whether their separation has been long standing, resulting from different post glacial migration events. Cedar trees are relatively long lived and very resistant to disease, insects and decay. The foliage and bark of young trees are a favoured browse of several herbivores, including deer, snowshoe hare and porcupine. Wetter stands in western Nova Scotia often support Atlantic Coastal Plain Flora, including some rare species. Cedar is legally protected and listed as vulnerable under the Nova Scotia Endangered Species Act.